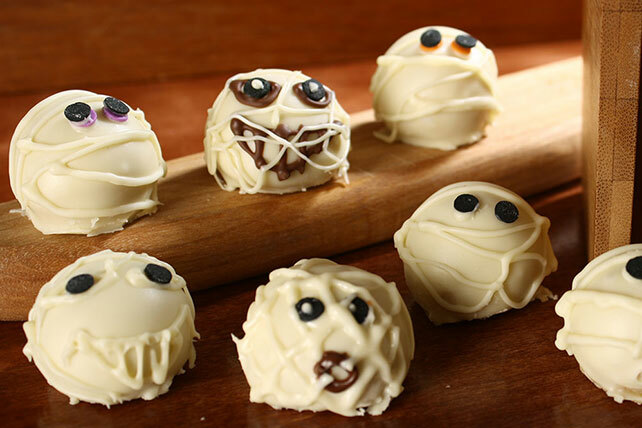 Create an easy-to-make Halloween treat with these monster cookie balls. Halloween Monster Cookies Balls will be the new favorite at your Hallows Eve bash! Melt remaining chocolate as directed on package; spoon into small resealable plastic bag. Press out excess air from bag; seal bag. Cut 1/8-inch piece from one bottom corner of bag. Squeeze bag to pipe chocolate onto each ball for the mummy's eyes; immediately add desired decorations for the eyeballs. Pipe remaining chocolate onto balls to resemble gauze strips. Refrigerate until firm. You'll know it's a special occasion when you get to enjoy a serving of these indulgent cookie balls. Use a toothpick to dip each cookie ball into melted chocolate; shake off excess chocolate, then place ball on waxed paper. This may leave just a small hole on top that can be covered with a tiny dab of chocolate. Black Cat Pops: Prepare as directed, inserting 2 BAKER’S Semi-Sweet Chocolate Chips into each ball for the cat’s ears before coating with melted BAKER'S Semi-Sweet Chocolate. Refrigerate 1 hour. Add candies for the eyes, noses and whiskers, securing with remaining melted chocolate. Jack-o’-Lantern Pops: Prepare as directed, except coat balls with melted BAKER’S White Chocolate mixed with 20 drops yellow food coloring and 10 drops red food coloring. Refrigerate 1 hour. Add broken pretzel sticks for the stems and candies for the jack-o’-lanterns’ faces, securing with remaining melted chocolate. Prepare using regular OREO Cookies. Melt BAKER'S Semi-Sweet Chocolate as directed on package; use to add extra detail to the mummies' eyes and/or mouths.